These days the leader in (fun) office design is Google. Reinventing the workplace to accommodate different tastes, Google have placed their emphasis on ensuring employees are satisfied, comfortable, and in turn more contented on a daily basis. They utilise bright colours and interesting designs to allow individuals to engage with their office space, while focusing on elements that drive productivity and efficiency. Today on homify we are taking a look at how to Google-fy your home office. But what are the benefits? Working from home definitely has its upsides. Forget about stuffy offices, bothersome co-workers, and uninspiring décor, working from home means no commute, and a far better work-life balance. As another added benefit, working from the comfort of your own home means you can design your workspace as you see fit. Now, you may ask what the advantages are of having organised and designed your own office. Ultimately, your study and workspace is where you will be spending the majority of your day. If you build something that inspires, you are almost guaranteed to be more productive, and far happier. If you would like some handy hints inspired by fabulous examples take a peek below, and make your home office a Google-esque workspace of your dreams! The first step towards having a fantastic Google-approved office space is to rethink your layout and floorplan. 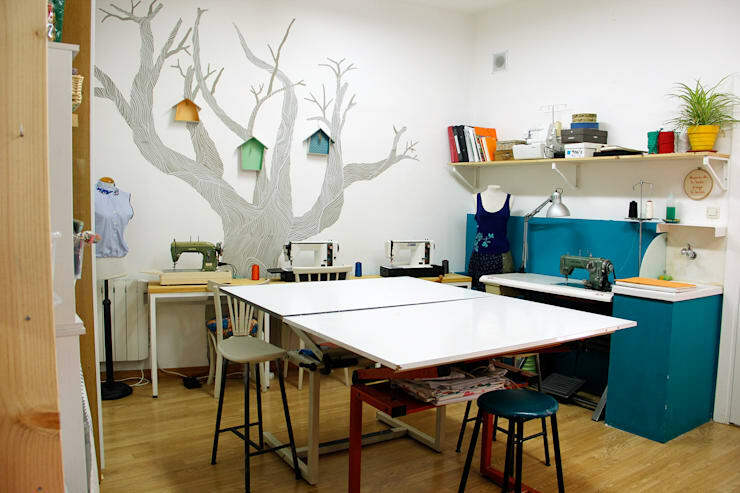 Now, this may not always be possible, as many of us have home workspaces that are compact or cannot be altered. However, within this space there are always changes that can be made. Consider the position of your desk, and how this affects your productivity. If you are sitting in the middle of a room, looking straight at a bland and uninspiring wall, it is likely that your work will be similar. It is important to stay inspired, comfortable, and make the most of the area you have. Google workspaces avoid putting individuals in box-like cubicles, as this type of desk is repetitive and tedious. Choose an area of the room that is the best for you to sit and feel comfortable, perhaps looking out through a window, or even into the centre of the space. This example is truly fabulous! Embodying everything a Google office could possibly want, the desk is situated in a spacious and well-designed room, looking out over an impressive scenic view. 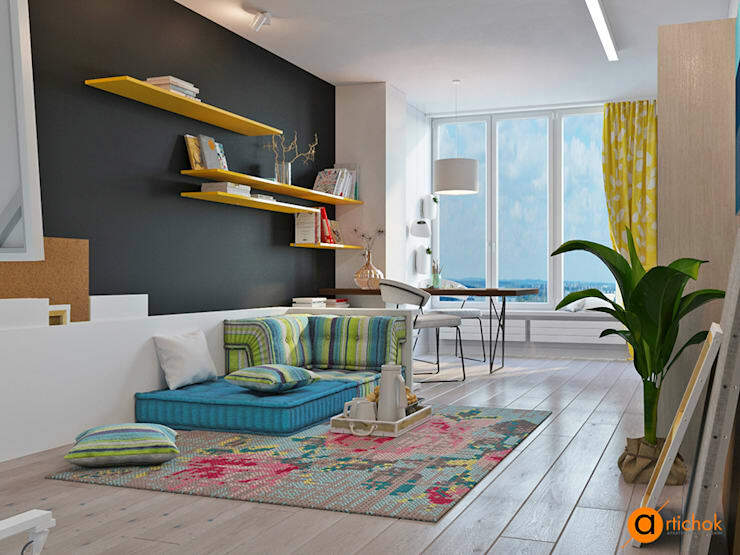 Although this type of room won't always be possible for everyone, take a few pointers from this stylish and sophisticated design. After a long few hours staring at a computer, you need a feed. And the best way to eat in style? Why, a Google style eatery of course. 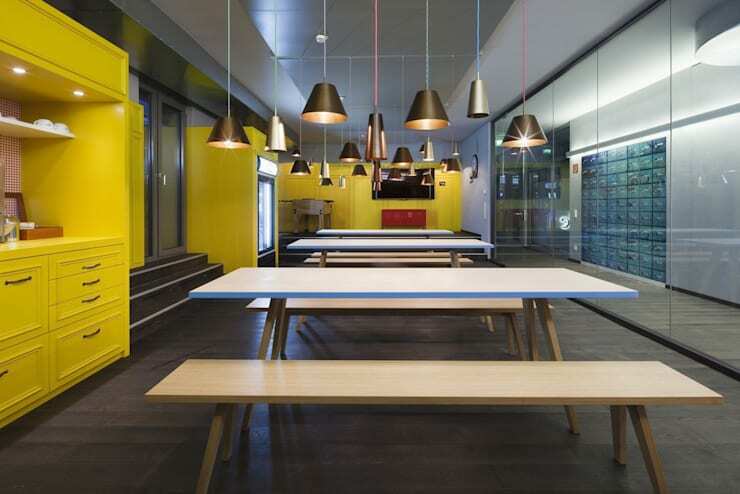 If there is one thing Google offices are known for is their cafeteria style dining setup. More than simply a place to pull out your soggy sandwich, these lunch areas are replete with comfortable lighting, large social spaces, and a sense of energy. Now, you won't want to entirely redecorate your home kitchen and dining space purely because of your home office, but you can make slight alterations that will help you along during the day. One of the biggest problems with working at home is the element of distraction. Some individuals are highly motivated and easily stay on task, others are not, and can find home workspaces filled with a huge amount of diversions and interruptions. Consider creating a dedicated eating space in your home that is used purely for lunch during your work day. By employing this, you will ensure you don't end up cleaning dishes, vacuuming floors, or engaging in any other unnecessary home activities. Nothing says Google more than bright primary colours! Take your cues from the Google logo itself, and employ a few illuminating hues into your home. Yellow, red, blue, or even green, you don't have to go overboard to create interest and style within your home office. Pick one or two colours and insert them into the room in unique ways. In this above image we see a bookshelf that utilises sections of yellow for cupboard doors. 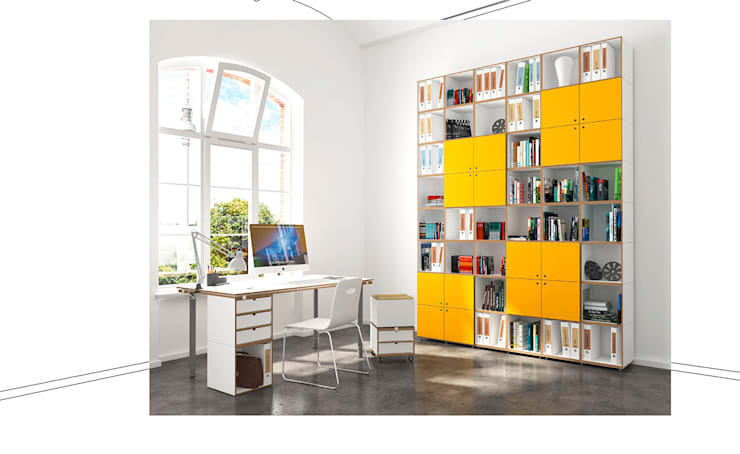 This provides great storage (an essential for a productive office) as well as brightening up the interior. The desk is in a maximally productive area of the room, and the entire space is welcoming. Glass is a fabulous material. Not only does it act as a barrier between spaces, but it does this in a minimal, and space enhancing fashion. If you are working throughout the day in a room, why not bring the exterior areas 'in'? 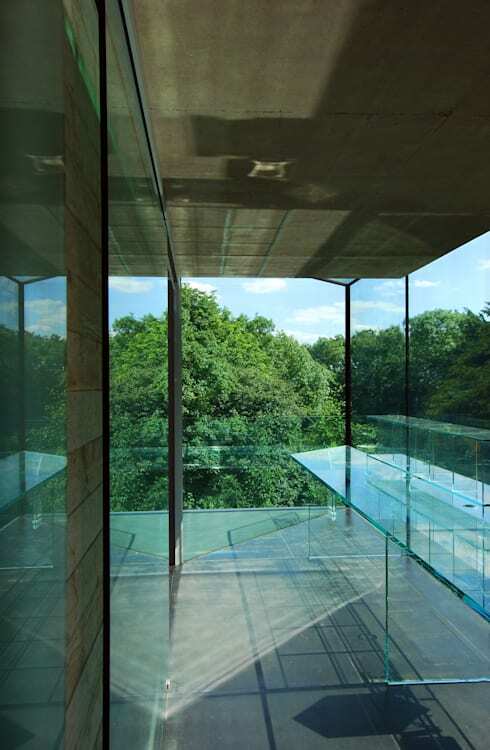 Employing glass will help create a room that breaks down barriers, while offering privacy from outside noises. This example is a particularly wonderful study designed by renowned architecture firm Eldridge. The space is enlightening, and looks beautifully at one with the exterior environment. Creating a glass office can be difficult. To get the design of your dreams, ensure you chat to a professional architect who can help realise your vision. It sounds counterproductive to discuss play within a workspace, but that is exactly what the Google designers are known for. Work shouldn't be an unexciting chore, rather it should be interspersed with activities that keep your mind and body active. In doing so, you will be more efficient, and enjoy your time at work. Taking this into consideration, the concept is to include activities within your home office. Activities could range from a mini golf space, to a pinball machine, to an exercise space, with the emphasis on getting away from a computer, and breaking up the day with a little excitement. 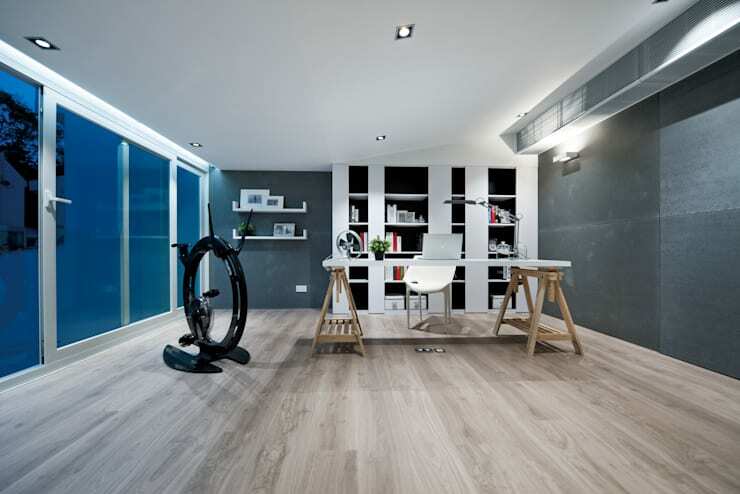 The latter is shown in this image, with a cycle machine allowing the room's occupant to get active and fit! Collaboration is an essential part of many jobs, and can enhance the quality of work tenfold. Encouraging positive collaborative efforts is far easier when you have an adaptable and usable space, such as the one in this example. Google is a company that prides itself on its joint work spaces, and this can easily be replicated within your domestic study or office. Choose a large table, plenty of seating, and get involved in joint projects within your newly styled and fabulous home office space. Last, but certainly not least we are going to take a look at comfy seating and lounges. 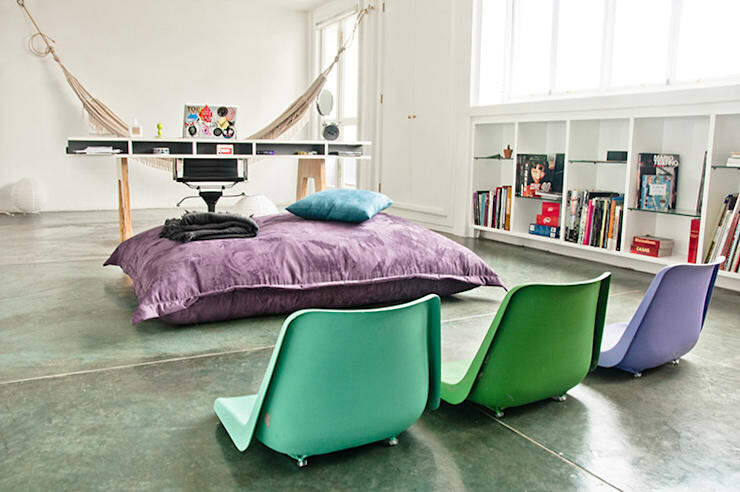 If you haven't already put comfortable seating into your home workspace, now is the time! Having a different area to sit and relax is in part key to Google's success. We aren't advocating that you do all of your work from the comfort of an overstuffed sofa, but a small part of your day can benefit from being away from the rigid confines of a computer screen. Think floor cushions, bean bags, sofas, and plenty of inspiring written material to help you unwind, brainstorm, or build your productivity. What do you love (or loathe!) about Google styled workspaces? We'd love to hear what inspires you in the comments below!